Our portfolio of base station antennas covers frequencies that range from 25 to 3800 MHz. This includes both narrow band, broadband, and multi-band models. Designed to meet toughest requirements in terms of applications and functional operation, all antennas are manufactured with premium quality materials for extensive maintenance-free operation. Due attention is paid to aesthetics and flexibility during the development of any new product, ensuring customer satisfaction with regards to price, performance and quality. The wireless cellular mobile industry relies on the RFS base station antenna product line for GSM, SMR, Cellular, PCS, TDMA/CDMA and other leading standards. 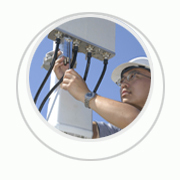 CELite® antennas are renowned for their unique monolithic design, high reliability and broadband capabilities. Our butterfly dipoles reduce our antenna dimensions, enabling the construction of highly compact tower sites with low visual impact. Continuing the road of innovations to 3G and UMTS, we have introduced low visual impact antenna systems with dual and triple band antennas for both fixed and continuously adjustable electrical downtilt.